Back in 2003 or so, I was teaching a film appreciation course. Each day was devoted to a specific aspect of filmmaking (cinematography, writing, sound, etc.). I'd start the class with a brief summary of the topic of the day and some notes about its various techniques. Always leaving room for questions, the first part was mostly lecture-based. I'd show samples of these techniques to give the students an idea of what to look for in the next part of the class, which was to watch an entire movie. One of the days focused on editing, which I'm very partial to, since most of my film career has been as an editor; it was also what I concentrated on in film school. Determining which film for each aspect was always tough since there are so many to chose from. For the editing class, however, it was very easy. I chose Christopher Nolan's 2000 film, Memento. Anyone who's already seen the film will understand immediately why I chose this film. Editing is crucial to the way the story is told. In fact, the timeline is basically played out backwards, possibly to disorientate the audience. You see, the main character, Leonard (Guy Pearce), suffers from anterograde amnesia, which prevents him from creating new memories. I imagine Nolan, along with his editor, Dody Dorn, decided to mix up the order of the timeline to make it easier to relate to such an unusual impairment. The film can essentially be broken into two main sections which are distinguished by color and black-and-white cinematography. The color photography is played out backwards and is the bulk of the film. The black-and-white photography takes place in a room with Leonard on the phone. Throughout the black-and-white scenes, the audience is listening to Leonard talk to someone about an insurance case he once investigated. As an insurance agent, it was Leonard's job to dismantle cases that were deemed fraudulent. The case in question is of Sammy Jankis. Sammy suffered from the same affliction as Leonard (before Leonard's accident, of course). Leonard goes on to explain the case in detail, and with this story we can study Leonard's current dilemma. But more important is how this part of the film helps break up the color part of the story. And it makes sense that the black-and-white "Sammy" section is told chronologically, because this is a memory before Leonard's condition. After watching Memento for the first time, I was curious to know how I was able to understand everything despite the broken timeline and the backwards storytelling. I later watched it again, but this time I put on the commentary track on the DVD. The director and editor explained the use of sound cues to tie scenes together. Here's how the film is played out: a scene would start at a certain point then stop just after something exciting or after a revelation. It would be followed by the black-and-white "Sammy" section of the story. The following color scene ends from the beginning of the previous color scene. It's a little hard to explain and people have actually created diagrams. Wikipedia has a great one. Needless to say, it can get tricky to understand the first couple times, which is why so many people have created diagrams. 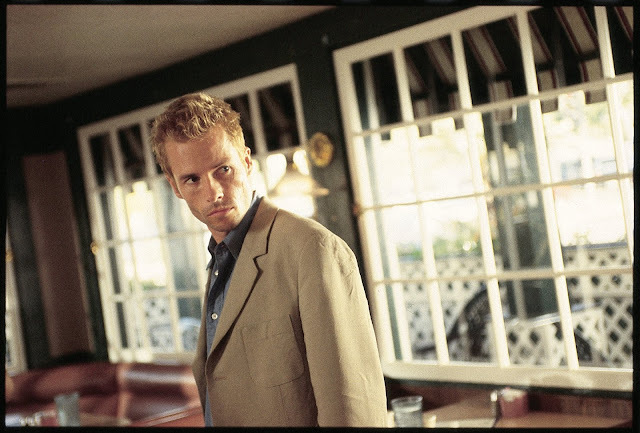 But beyond the impeccable editing, Memento also boasts some talented performances by a surprisingly small cast. In recent years, Nolan has expanded his films with large casts and blockbuster spectacles such as The Dark Knight trilogy, Inception, and Interstellar, to name a few. With Memento, however, he compacted his characters to three main actors: Guy Pearce as "Leonard," Joe Pantoliano as "Teddy," and Carrie-Ann Moss as "Natalie". There's also the "Sammy" character played by Stephen Tobolowsky. Stephen Tobolowsky as "Sammy Jankis"
Tobolowsky has very few lines in the film, but he makes them count. In the little time he gets onscreen, Tobolowsky makes his character sympathetic by showing how his disease can bring out an unpleasant side of someone who's normally mild-mannered. And given the fact that he doesn't have much time to show who he was compared to who he's become, it's a true testament to Tobolowsky as a dramatic actor, especially for someone who's normally found in comedies. Like the "Sammy" character, the other characters play a large role in Leonard's distrust. No one around him is reliable, and with short-term memory, Leonard is often found on the wrong end of the stick. His relationship with "Natalie," a damaged woman with ambiguous motives, makes for an unusual partnership. 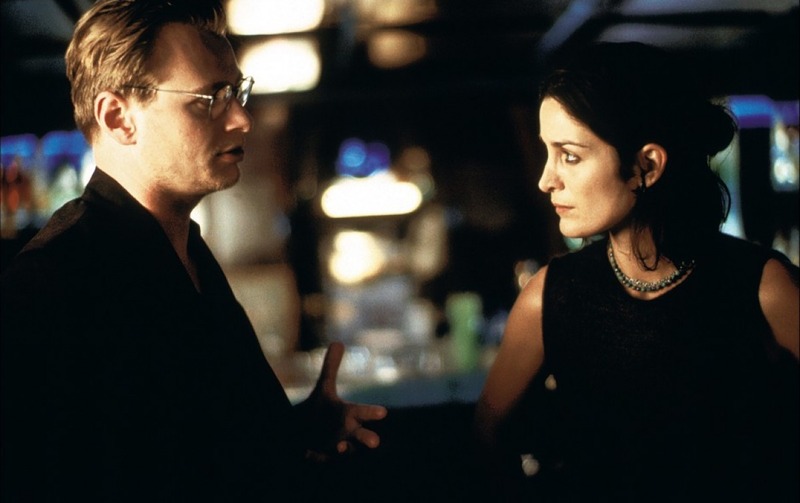 Carrie-Anne Moss does an excellent job portraying a sad, but possibly vindictive, character. Her role provides the question of what guilty means. 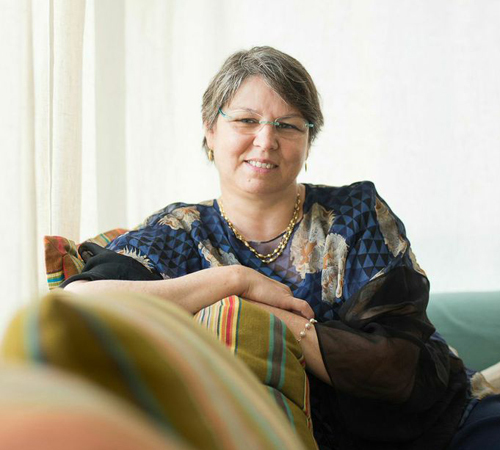 Is guilt based on a point of view, or is there no such thing as innocence? Director Christopher Nolan and Carrie-Anne Moss as "Natalie"
Then there's "Teddy," played by the underrated Joe Pantoliano. As Leonard's friend, or foe, depending again on a point of view, Teddy is Leonard's sidekick. Leonard thinks his mission in life is to find his wife's killer, and Teddy has been helping Leonard out with the case. But who is fooling who? Is any of Teddy's information reliable? Is Leonard fooling himself thinking he can solve this case? Is Teddy merely enabling Leonard's desperation because he feels sorry for him? When there's no one to trust, how can a mind ever find structure? One of my favorite traits of Christopher Nolan is the psychological aspect of his films. Of course, when you talk about a Nolan screenplay/story, you usually have to give half the credit to his brother Jonathan "Jonah" Nolan. 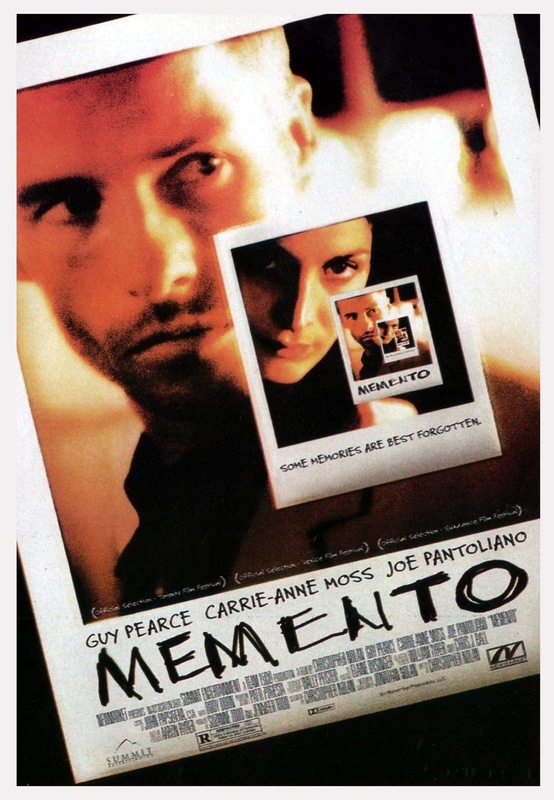 Memento was based on his short story "Memento Mori". It was one of his first collaborations with Christopher, but definitely not the last. He went on to write the screenplays for The Prestige, Interstellar, The Dark Knight, and The Dark Knight Rises. I love films that deal with the mind, and the Nolan brothers know just how to do it right. 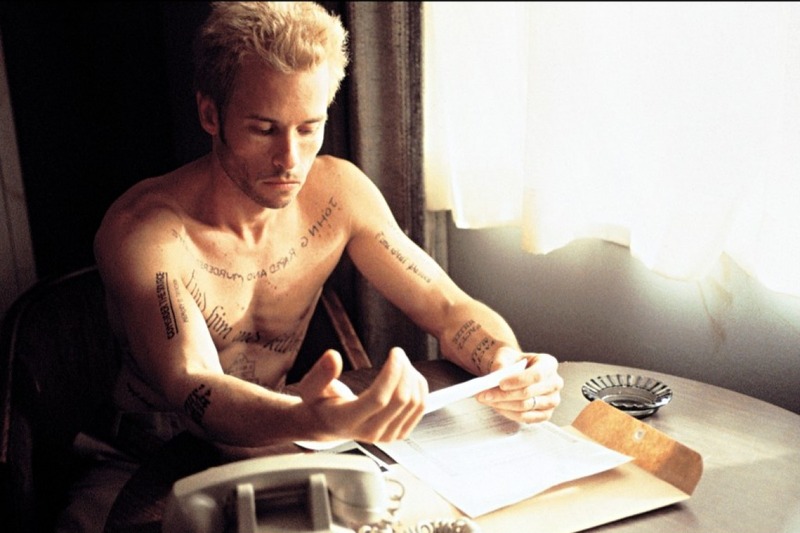 I think if I had to choose, I'd pick Memento as their best example of a psychological story. Surrounding a character with untrustworthy people and situations, with the addition of short-term memory, is unique as is. But then to use editing to enhance that feeling of disorientation is beyond excellence. This was my first taste of Christopher Nolan, and I've gone on to become a big supporter of all his films. There are times when I wish he'd go back to small casts and lower-budgeted films, but maybe that's just me. He is, after all, doing quite well at the box office, which means other people are digging what he's doing. TRIVIA: Leonard uses a Polaroid 690 camera throughout the film.